← What is it with the systems approach? Relating Systems Thinking and Design … is the title of a symposium held in Banff, Canada on September 1, 2015. 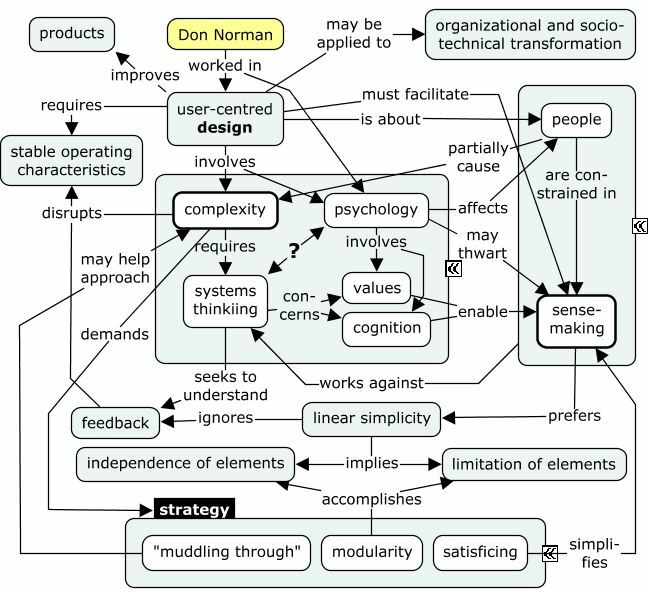 The keynote was delivered by Don Norman, whose work mostly involves user-centred design (e.g. at Apple in the 1990s) or its advocacy. The keynote was lightly based on a paper written with Pieter Jan Stappers, who teaches Industrial Design at Delft University of Technology. 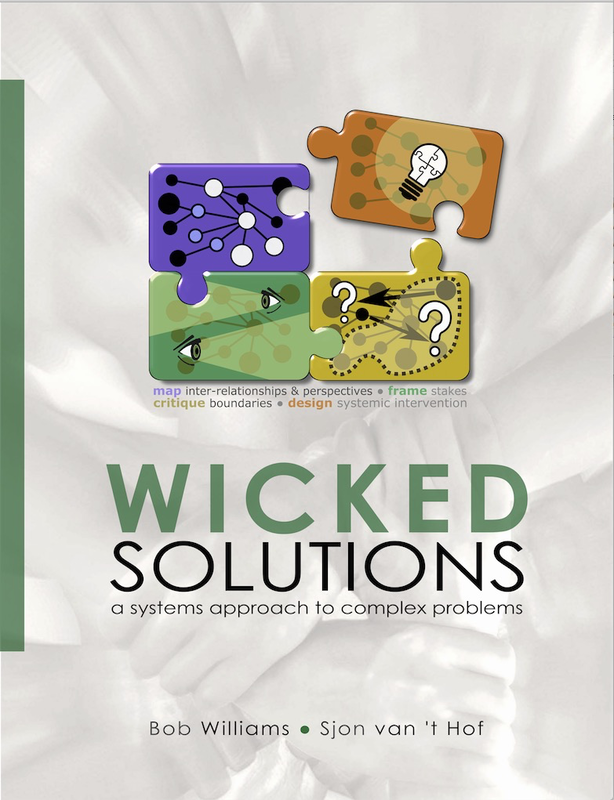 I have written a bit on design and systems thinking, hence my interest. Serendipity being what it is, the keynote gave me totally unexpected insights, which was excellent, because I was sorely in need of them. A likely case of a Jungian synchronicity/sensemaking mash-up? Complexity and sense-making … is what the keynote (Youtube) was about, whereas the paper emphasizes that the main challenges of complex sociotechnical systems such as healthcare, transportation, governmental policy, and environmental protection “stem not from trying to understand or address the issues, but rather arise during implementation, when political, economic, cultural, organizational, and structural problems overwhelm all else.” In his speech Norman points out that people are constrained in sense-making of complex situations and their “solutions” by a variety of psychological factors, including a preference for understanding problems by way of linear simplicity and a strong dislike for the loopiness of complexity. Clearly, people’s preferences are completely at odds with complexity’s demands. Accommodating linearity Norman concludes that for the sake of implementation we need to accommodate this preference for linearity by means of a three-pronged strategy: (1) cut up inquiries or solutions in more or less self-contained modules; (2) do not go for the best possible solution (that risks not being implemented at all), but rather accept a workable solution that allows a few steps forward; and (3) see the benefit of taking small steps at a time (incrementalism or “muddling through”), because any design for improving complex sociotechnical systems runs a high risk of going haywire anyway. Now clearly, implementation is very important. Without it, nothing happens. Churchman, the “inventor” of the systems approach, elevated implementation to category status in what is now known as the “critical heuristic”. The question is whether accommodating linearity by incrementalism, modularity, and satisficing is (always?) the best way to ensure it. Systems approach as the baby I didn’t tell you yet that I am a systems approach buff. Well, I am and I like it so much that I spent the last three years thinking and writing about practical ways of applying it (see Wicked Solutions). So, caving in to people with a general preference for linearity is hardly an option. It would mean denying everything systems thinking stands for and feels like throwing the baby out with the bathwater. Yet, Norman and Stappers have a point. Implementation is key. I can think of two solutions: (1) “muddling through” may be acceptable in the case of conflict, i.e. in situations where it is impossible to find common ground in a win-win and a zero-sum approach must be accepted temporarily. Yet, even then it is good to have some idea, by means of some form of systemic design, in which direction non-zero-sum solutions are likely to be found; (2) it may be possible to reformulate the analysis and its solution in a linear frame. I suspect this is often done in practice, without people being aware that some considerable systems thinking has preceded a relatively simple solution (this is actually the meaning of the bi-directional arrow with the question mark linking the ‘psychology’ concept with ‘systems thinking’). The magical number seven The second solution of linear reframing is what I am currently working on. The reason is that a systemic inquiry and its solution involves a large number of ideas. While one is at it, it is just about possible – with some effort, heuristics, and paper – to handle say forty or fifty ideas. But once the inquiring and resolving is over, there is a serious problem of communicating the result. In 1956, George A. Miller wrote a paper about the limits of short-term memory, which seems to be at the bottom of this. My idea is that both the systemic inquiry and the systemic intervention design need to be recast in a more linear (or at least considerably less loopy) form to convince everybody concerned. This ‘recasting’ is in fact also a ‘design’ of sorts. It involves some kind of ‘chunking’ to remain within Miller’s limits. Ideally, the ‘linear’ intervention redesign must follow logically (i.e. in a ‘linear’ logical fashion) from the ‘linear’ inquiry redesign.